When you are asked to calculate average atomic mass in either chemistry or physics, you look up the atomic mass number of each element on the periodic table, multiply it by the percentage of abundance and then add each of them together. The sum of each element's mass numbers added together is the total average atomic mass of a group of atoms. How to Calculate the Mass Number of an Atom? To find the mass of one atom, look up the element on the periodic table. The atomic mass or weight is the decimal number for that element. For example, if you are asked to find the atomic mass of lithium, you find the symbol for it, which looks like 3Li on the periodic table. The decimal value is 6.94, so that is the atomic mass of lithium. Alternately, if you are given the amount of neutrons of a single atom of an element, you will need to add the protons and neutrons together to find the mass number. For example, if you want to calculate the atomic mass number of one isotope of lithium containing 4 neutrons, look up 3Li on the periodic table. You'll see that it has the atomic number of 3, which is the number of protons in the element. You then add the protons and neutrons to get the atomic weight or mass number of the element. Your answer to this question is 7 in the above example. What Is a Weighted Average of Atomic Mass? Atomic mass is really a weighted average of all the element's isotopes based on their natural abundance on Earth. If you're given a list of isotopes to calculate, look for the exact mass of each isotope (that will be in decimal form, but if all you have are whole mass numbers, use those). Find the element on the periodic table, multiply the mass of each isotope by its abundance and add each of the results together. This gives you the total atomic mass or weight of the element. Then, add the sums together for your final answer. 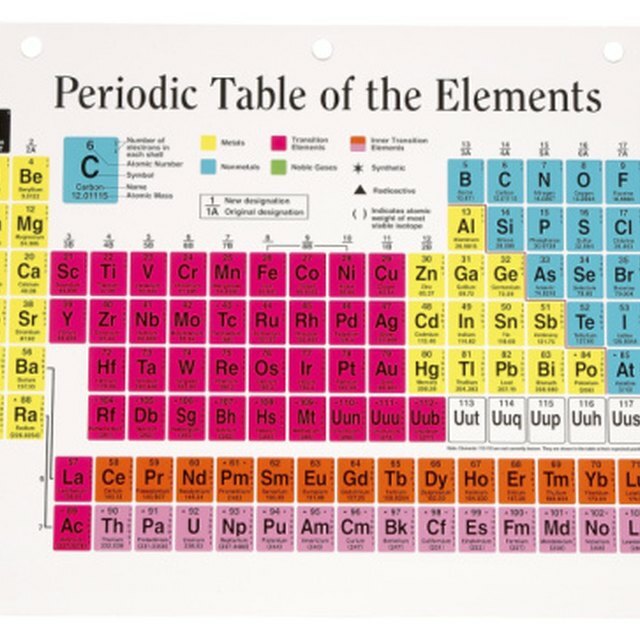 The values on the periodic table are in the form of atomic mass units (amu). For chemistry, your answer should be expressed as grams per mole (g/mol). For example, the atomic mass of lithium is 6.941 grams per mole of lithium atoms or 6.941 g/mol. Lougee, Mary. "How to Find Average Atomic Mass." Sciencing, https://sciencing.com/how-to-find-average-atomic-mass-13712154.html. 22 May 2018.